Jacki Coyle, a dear friend of Still Water, and the Executive Director of Shepherd’s Table, will join us for our program this Thursday. She will share some of her life story and encourage us all to consider “What comes next in our lives?” In the reflections below, Jacki begins her sharing. Life is amazingly good. I am blessed to serve at Shepherd’s Table, a nonprofit in downtown Silver Spring serving people experiencing poverty and homelessness. I am in my 15th year of service and I wonder what will be next and when next will occur. Before I came to Shepherd’s Table, from 1996 to 2004, I served with Catholic Charities in Baltimore including as Director of My Sister’s Place, a day program for women and children who were homeless, and, also, as Director of Our Daily Bread (ODB), Maryland’s largest provider of meals for women, men and children experiencing poverty. At ODB we served over 800 meals a day, 7 days a week. We never missed a meal. We had a small outreach center, Samaritan Center. to meet the needs of those experiencing homelessness as well as those who had a home but were living in poverty. Before Our Daily Bread I served in parish ministry for 19 years, the last 10 in youth ministry and outreach services. I was fortunate again to work with folks living in poverty and with those experiencing homelessness. As I look back at my journey over the last 42 years; I see common threads: service, poverty, homelessness, vulnerable sisters and brothers, making a difference, leadership, community engagement, spiritual underpinnings, walking alongside others, justice, and a CALL. I am sure there are more. As I live into my 68th year of life in 2019 I wonder what next and what direction I will be moving into on my life journey. I honestly do not know. Will I remain at Shepherd’s Table and continue my work? Surely there is more to do. Will I seek a change? What is next? What is God calling me to do, to be, to become? I know the journey does not end in retirement. Throughout my life the thread that stand out the most is the sense of call. I know clearly that I seek to follow a call just I have done for many years. 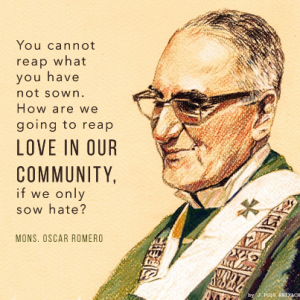 I think often about Oscar Romero in El Salvador, a humble priest who became Archbishop. He reluctantly accepted that call and found himself changed as he served his people and saw their suffering. His voice became the voice of the people, a voice against poverty, social injustice, assassinations and torture. He was assassinated in 1980 while presiding at Eucharist in his home country. His life has inspired me to live a life of service to those who are most vulnerable, to be a voice for those who are poor and homeless. As I look at what is next in my life, I want to notice the signs that are now and will be in my path. I want to see how God is calling me. As we gather on Thursday evening; I hope to share with you a small piece of my journey and to ask with you: What is next? I invite you to consider your own journey. To what, to whom are you being called? What is next for you? What is next today? Tomorrow? In the future? There are so many words of Oscar Romero that inspire me. Let me share just two here.